While for Sonam Kapoor it is very essential to be “Hot”. Contrary to being “Hot” Deepika feels it is essential to be fit and healthy. Also, Recently, Sonam has been honoured for topping the Annual Hot 100 list of a Men’s magazine. 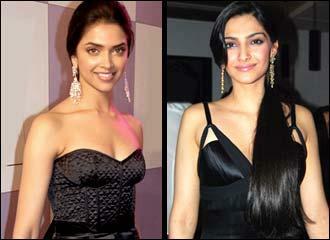 So guys, according to Sonam, being hot certainly helps.” However Deepika begs to differ. ” Refreshing her childhood memories Deepika says, ”As a child I have grown up with a sports background. I am made to understand that it is not essential to be ‘hot’. But what is more important is that one needs to be fit and healthy.” She practices proper sleep, lots of water intake, balanced diet, optimum exercising and regular meditation. Well, no rocket science. Sonam and Ranbir ever to be seen together on the silver screen again? Can Deepika Sleep in Water?